It's that time of year again when artists and modellers need to start thinking about the upcoming Papercuts Showcase! Thoughts like; "What should I draw or design? ", "What should I build? ", "What should I mod?" and this year should also have the thought, "How do my game rules even work anyway?" The competition will launch the first of August and run until 8/31/16, followed by voting for category winners. Here is the rough layout of this years showcase and guidelines. Much of it has remained the same as last year except that participants are allowed to post five pictures of their creations instead of just three. There is also the additional category of print-n-play games for those burgeoning rules designers out there. Category winners and voting will be a little different this year; At this time there will only be prizes for the first place winners in each category. Voting for category winners will take place the first three days of September, category winners will be declared, then Best of Show voting will follow for the next two days and only category winners will be in the Best of Show category. Items that have been previously released as a commercial item are not eligible as a design submission. The submission deadline for this year is August 31st, 2016. 1) Best Single Figure - The design must be original*. Five pictures maximum to show off your work, download required. 2) Best Multi-figure - A group of figures. All figures must be original design*. Five pictures maximum to show off your work, download required. 3) Best Model kit - 3D terrain, vehicle, building- what have you, a multi-piece kit. Original designs only*. Five pictures maximum to show off your work, download required. 4) Best Tileset - Flat, two-dimensional maps with grids or no grids of any size or quantity. Original designs only*. Five pictures maximum to show off your work, download required. 5) Papercraft in Action - A diorama** scenic category. Models and miniatures can be from any published or original source. Papercraft must feature prominently in this categories entries, but can also feature elements from other mediums; metal or resin minis and models for example. Five pictures maximum to show off your work, no download required. 6) Hot Rod and Kit-bashers - A papercraft diorama** scenic category, but with a personal twist. 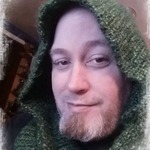 This category is to highlight how you improved, modified, or mangled someone’s work. There are many examples in this forum of users modifying a designers work. Five pictures maximum to show off your work, no download required. 7) Print-n-Play - Original game rules design that must include, or provide links to, free game pieces suitable for your rule set. Prior Forum Hoards or MMiP archive items are ideal for this if you do not create/include pieces of your own creation. 8) BEST IN SHOW - The one entry that says Papercuts 2016 to you. This category will be assembled from the winning entries in the other categories. 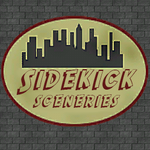 Be sure to add model sources; Miniatures by Okumarts and Squirmydad, models by Squirmydad and Worldworks Games, ground tiles by Fat Dragon Games. No download required and the diorama does not have to be made up of pieces that you personally designed. *In Addition Brave Adventures will be offering $6 in credit for their website to all participants in this year’s competition. After final judging, Brave Adventures will give 600 points ($6 credit) to all participants with accounts at www.braveadventures.com. Design submissions will be in the form of photographs of your figures and models as well as a free download of the entry. I recommend services such as Dropbox for the download and for the image hosting. Create a new submission in the appropriate forum category between now and the deadline; 08/31/2016. Builder submissions will be in the form of photographs of your figures and models. I recommend services such as Dropbox for the download and for the image hosting. Create a new submission in the appropriate forum category between now and the deadline; 08/31/2016. More to come as I'm sure clarifications will be in order. I asked Mauther if he would be willing to do a post, and he did! Quick question on the dioramas, would short clips be allowed in the event of moving parts =) just a thought. One entry per person per category right? So Someone could enter a tile set and a model kit or a model kit and a figure etc etc? Like a gif or stop-motion animation? As long as the total number of images/frames used doesn't exceed the maximum number allowed then it's fine. Already started on my first entry! Brave Adventures is helping to sponsor the 2016 Papercuts and will be offering $6 in credit for their website to all participants in this year’s competition. After final judging, Brave Adventures will give 600 points ($6 credit) to all participants with accounts at www.braveadventures.com. That would be category #2; Best Multi-Figure, so yes. ok I was thinking like a whole army would include multi part kits like the Dark elves for instance have buildings, and the reaper bolt thrower as well as the Fell bat riders (I'm almost done with the cold ones) and then there are many sheets of warriors both pointy spear people and (again multi part crossbow men) as well as witch elves and I'm working on a boat for the Corsaires and so on .... So when I say Hoard I mean an Army with all the trimmings..... that would go in #2? becasue it's more than just Multi Figures.... it's an entire set really.... an army? Perhaps a photo spread of the diorama for the "Papercraft in Action" category? Who is considered a participant? If I am more than one artist under one name - can I take part in the event? I would hope that each individual would be honest and each individual would only post one entry per category, regardless of how many accounts any particular individual may have. 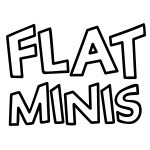 Some details then - Flat Minis is a hub (though at the moment under construction) for paper miniatures and there are various artists drawing their designs for this project. Imagine a website, where you can find lots of different miniatures drawn by lots of different artists. The question is - can Flat Minis contribute to this event as Flat Minis, or is this a matter of individual artists, and participant is a person who creates the design. flatminis, When I google flatminis I get plastic 3d prints. Can you give a link to the paper site? Vermin King, do I understand correctly, that I can submit a different entry as long as the miniature is designed by different artist? Cowboyleland, domain was used for that project yes, but it is under new ownership and new activity now. Website should become alive next month, meanwhile there are some strange teasers on FB only. Vermin King, do I understand correctly, that I can submit a different entry as long as the miniature is designed by different artist. That sounds strange to me. If you did not design the minis, you should not submit them at all - if not against the letter, for me it is against the spirit of the contest. I thought the idea of this was to be sharing/appreciation the work of the participants of cardboard-warriors participants - am I wrong? To me (at least) this is a community having fun sharing it's accomplishments. To me, this isn't a public internet contest trying to gather the best from the entire world. I would be very uncomfortable with any participant (single person) coming in and posting multiple entries in any category - no matter what the category - it's against the rules. No one should be posting on behalf of anyone but themselves. If some minis artist wants to join our community and share with us (Hoards, Tips, Tricks, Builds, etc. ), that'd be AWESOME. And more than one new member did so *starting* with an entry in the contest (or practically so) - I think I encouraged one or two personally. But please, post only your OWN WORK, and only 1 per category. If you agree squirmydad - perhaps some clarification is in order for the rules? Perhaps an "intent" paragraph? Sometimes it is hard for me to fully understand complex speeches in English. I apologize. for what I have understood I have to agree with oldschooldm. But I have different thoughts about some things. I think he can represent other authors if this is official representation (and I think it is so, given their kickstarter project). I think so for several reasons. Meanwhile, no matter who presents the project. No offense to anyone, but any honor for a project always goes to the author, not the "publisher". Then the author might not have time, flatminis could represent a circle of authors ... Imho it is important to understand what happens if a person presents works by various authors. My opinion is that this is counted as a single entry. Otherwise, each person presents his own works. And then each entry is considered autonomous. It is a choice at the end. But this is just my personal opinion and I am not an author. Also ... if my speech is quite incomprehensible ( as I believe ) you forget about everything. Consider it an OT spam. Rather ... nothing about new paper minis/works and that they must be shared for free? Proxy representation will not be allowed. I see a paragraph for clarity will be needed in the final announcement next week. As a business model a group like Flat Minis, or Brave Adventures, can represent multiple artists working in a cooperation towards common goals-which to me looks like a publishing house. That's great! However, a competition like this is set up to celebrate the accomplishments of individual artists. Therefore it is up to the individual artists to join and submit their works, no one else can do that for them for the purposes of this competition. That makes sense to me! That's part of the reason why I wanted Brave Adventures to take a sponsorship role instead of a participant role. pontus might want to submit something this year, so I'll make sure he does it on his own instead of as Brave Adventures. If I post anything as Brave Adventures this year it will be by me. I'm thinking about finishing off my old Jungle Fighters, for example. As you may or may not have noticed, in the revised final Papercuts rulings you can post links to as many pictures as you want, you just need to make sure you have one that is your "A" picture for presentation purposes. ahhh I hadn't read that ! good to know!! I look forward to see what all you talented people has to offer this year. Sadly, I don't have the mental surplus needed to cook up something myself, too occupied looking for a job here. So I have to skip this year, but I'm sure noone notices, anyway. And I can't wait to see the contributions begin to pop up! So, if I wanted to do a 2.5D mini of the upcoming new Star Trek series' ship which so far does only exist as a "not final design" in a 77 seconds trailer, and the mini being based on what can be seen in said trailer... Would that belong into the "Best Model Kit" or into the "Kitbashing Diorama" category? Or was I not allowed to enter the contest with this mini at all, since Star Trek and Discovery are (C) CBS/Paramount and not my personal intellectual property?